"A Map is the Greatest of All Epic Poems"
A year ago brother Johnny gave me a gift of a 2017 calendar of historic maps of the world; when the year came to an end it seemed like a shame to have the map plates go to waste, so I trimmed them out of the calendar and then went looking for a project. 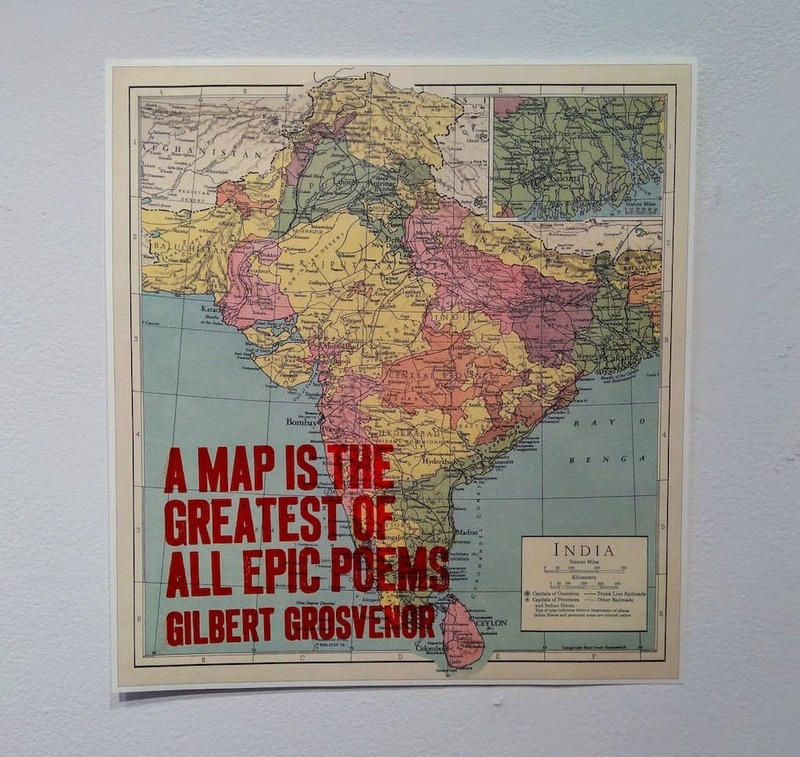 When I came across the quote “A Map is the Greatest of All Epic Poems,” attributed to Gilbert Grosvenor, founding editor of National Geographic magazine, I knew I had it. 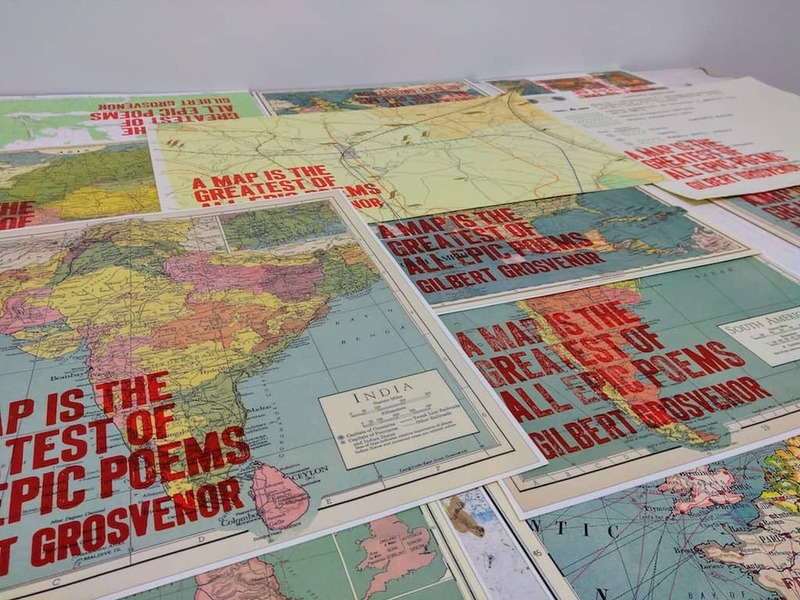 I printed the quote of the map plates in Akzidenz Grotesk, 60 point for the body and 48 point for the credit. 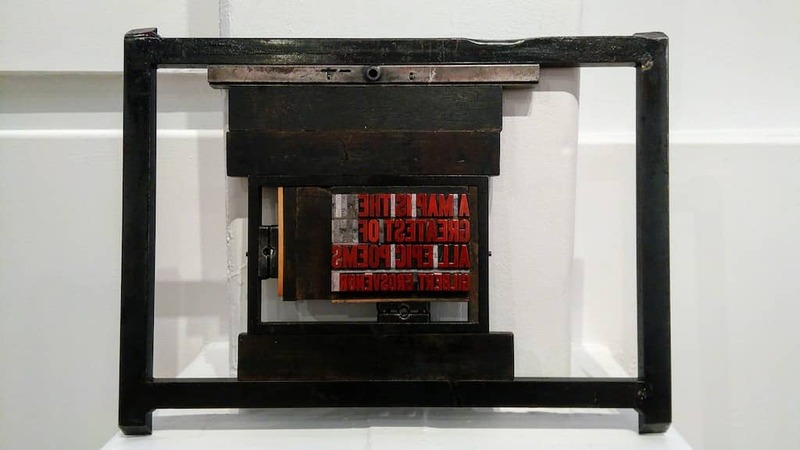 The type is well-worn, and so required a lot of packing to print legibly, more-so because the paper was textured (you can see the effect of the texture on the South America map in the photo above). Written January 23, 2018 at 3:14 p.m. Cool idea for the maps. I met Gilbert H. in the 1950's when residing in Baddeck where he and his wife Elsie May also lived. Elsie May Bell was the daughter of Alexander Graham Bell, and they lived at the Bell estate, Beinn Bhreagh. While visiting with them along with my family, I was told that it was okay to go outside with my sisters and look around. We quickly "discovered" an ancient sheep barn structure in the woods near the house. I was keen to tell the owners about finding it and explained that all they had to do to see it themselves was to go into the woods and they would find it. Elsie May, not wanting to burst the bubble of a curious five year old, told me that this was most interesting news and she would be sure to tell Gilbert all about it and he would investigate this discovery further. She then added that her father had a keen interest in sheep and that possibly this structure had something to do with his research. They were kindly folks with young children, and I thank you for sparking that memory. That is a lovely story that pleasantly transcends many generations; thank you. I left the “H.” out of Gilbert H. Grosvenor for reasons of space, but, now that I learn more about the family, and that Gilbert H’s father Gilbert M. was the founder of National Geographic, I regret the brevity. Correction: Gilbert Hovey Grosvenor was the father of Melville Bell Grosvenor, who in turn was father of Gilbert Melville Grosvenor. All three served as editors of National Geographic.